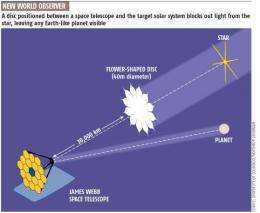 The James Web Space Telescope has been in the news a lot lately. Often referred to as the replacement for the Hubble Space Telescope, its existence has been in jeopardy since a House committee voted to cut its funding this summer. While the telescope promises to revolutionize space science, its expanding budget has caused politicians and others to wonder if the promised returns justify the cost. The JWST is not merely an upgraded version of Hubble. Rather than measure visible or ultraviolet light like Hubble does, JWST will detect infrared wavelengths from 0.6 (orange light) to 28 micrometers (deep infrared radiation of about 100 K (−173 °C or −280 °F)). Because JWST will be looking for heat, the telescope has to be kept very cold, and shielded from radiation coming from the Sun, Earth and Moon. 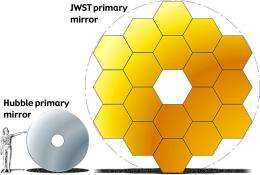 To keep the telescopes temperature down to 40 degrees Kelvin (−233 °C or −388 °F), JWST will have a large sunshield and will orbit the Sun at Lagrange Point 2. 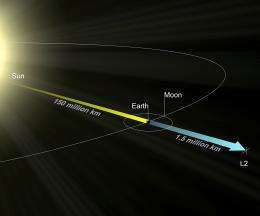 The orbit of JWST will be 1,500,000 kilometers (930,000 miles) from the Earth, nearly 4 times farther than the distance between the Earth and the Moon. The balance of gravitational forces from the Earth and Sun at the L2 point will keep JWST in a stable orbit without having to expend much energy. However, this great distance also means servicing or repairing the telescope after launch may not be possible. JWSTs complexity, with large deployable optics and other systems operating at 40 K in an environment precluding any repair or servicing missions, has probably created one of the worlds most complex and expensive integration and test programs, Michael Kaplan, NASAs first Program Executive for the James Webb Space Telescope program, wrote recently in The Space Review. While this testing protocol is a part of the ballooning budget, the Independent Comprehensive Review Panel Report, issued in late 2010, said the main problem was that the necessary development costs had not been properly estimated, and the budget therefore had been unrealistic. Five years ago, the project was estimated to cost 2.4 billion dollars, but the latest reports peg the total at closer to 8.7 billion. This July, the House of Representatives appropriations committee on Commerce, Justice, and Science moved to cancel the project by taking $1.9 billion out of NASAs 2012 budget. Maryland Senator Barbara Mikulski is now the projects main defender in Congress, since, as is the case with Hubble, the Science and Operations Center for JWST is the Baltimore-based Space Telescope Science Institute. 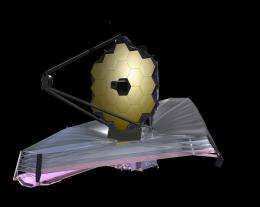 (JWST development is led by NASA's Goddard Space Flight Center, and the telescope is being built by Northrop Grumman Aerospace Systems for NASA, the European Space Agency, and the Canadian Space Agency.) While Congress deliberates the issue, NASA administrator Charlie Bolden said JWST is one of the agencys top priorities. He added that NASA needed to look across all its programs to find funding for JWST as well as its other two priorities: sending commercial crews to the ISS, and developing the next generation Space Shuttle: the Space Launch System (SLS). Due to the size of the budget, the journal Nature called JWST "the telescope that ate astronomy". Yet even if JWST is canceled, the money wont be given to other astronomical projects -- instead, under the recommendations of the House appropriations committee, the funding would be entirely eliminated from NASAs budget. As of this writing an estimated $3.5 billion has been spent on the JWST project, with about 3/4 of the construction and testing completed. If JWST is not canceled by Congress, it is scheduled to launch in 2018 on the European Space Agencys Ariane V rocket. Q: The James Webb Space Telescope should be able to find exoplanets, and now theres talk that a star shade could extend this capability. Could you tell me more about that? Matt Mountain (MM): The whole idea with the star shade is, once we get James Webb up there and working, then you can launch the star shade and it floats in front of it, a hundred thousand miles away from us. Its an autonomous vehicle that you keep lined up. MM: Its like putting your thumb in front of the Sun -- it creates a shadow. Its very carefully shaped, so you dont get the sort of flaring that you normally get when you use a perfect sphere, where you get all these rings and refractions. These petals are designed to create a very smooth, very deep shadow. You basically slide in and out of the shadow, and then you can actually see the planet next to the star. The star is in the shadow, and the planet peeks around the shadow. MM: Any planet thats within 1 AU, like a habitable zone, or [farther] out. John Grunsfeld (JG): James Webb is sold as studying galaxies, but I think its greatest discovery may be a habitable Earth-like exoplanet. Thats whats going to blow everybody away. Q: So youd be able to directly image a terrestrial planet, which has never been done before? JG: Exactly. But it wouldnt be like a Rand McNally map, it would be a spot. But because youd see a spot, we can then do a spectrum of that spot. MM: Youd actually get a color. If its like Earth, itll look blue. MM: You can only look at stars out to a certain distance, to about 10 or 20 parsecs. But thats ok, because the planets [farther out] are too faint anyway. Any farther away and we cant differentiate them, both the planet and the star will be hidden by the star shade. MM: Not the Kepler set, because theyre all very distant. Q: Theyre not within 10 to 20 parsecs? JG: They picked them not because they were close to Earth, but in a sense because they were far away. Not all of them, but in that one field [where Kepler looks], there were lots and lots of stars. And you say why didnt they point toward the center of the Milky Way galaxy, but thats too many stars. So their Goldilocks Zone is the number of stars in their field of view that was just about right so they can study 150,000 stars in one go. In order to see the nearest thousand stars around Earth, you have to look in all directions, because theyre spherically all around us. JG: But heres the key, and this is what James Webb can uniquely do. Lets say these cubesats [small satellites designed to hunt for exoplanets] identify in the hundred or so stars that are close to us, based on transits [when a planet passes in front of its star], Earth-sized planets in habitable zones around those stars. Thats all we can learn. We may be able to learn how far away they are from their parent star, their mass and diameter. Those are all good things. And you say, gosh, that looks a lot like Earth. But does it have oceans? Does it have an atmosphere? Are there any chemical signs of interest there? Thats where James Webb comes in, and thats what James Webb will be able to do with or without a star shade for a subset. The star shade expands that remarkably. It allows you to see the atmosphere of planets that are orbiting nearby stars. MM: Weve already shown with the modeling that if theres a SuperEarth with the right orientation, where the planet transits the star, we can detect liquid water. You can look at the spectra for water in the atmosphere and other things. JG: You can do atmospheric transmission from a transit. Now, what if its not transiting? Then what do you do? James Webb needs a star shade for those others. MM: If you think of it geometrically, the orientations got to be right. If you do the statistics, youll measure a transit for 5 to 7 percent of stars. Well, 5 to 7 percent is already a small number, and theres a small number of Earth-like planets, and a small number of those will be in the habitable zone. But what you really want to do is a census of all the nearby stars, and take spectra directly, independent of the orientation. The star shade enables that. MM: The technology has all been going really well. One of the most challenging things was the mirrors. Each individual mirror on James Webb is close to a Hubble. We have all the mirrors. Half of them are in boxes, and theyre all ready to roll. JG: About 6 billion in todays dollars, not including science operations. James Webb started in earnest in about year 2000, and itll take about 15 years to complete, and then test and launch. Hubble started in 1975, and it took about 15 years to assemble, test and launch. Hubble is 26,500 pounds, and James Webb is about half of that, but more complex. To build something brand-new, technologically advanced, pushing the envelope in its time, itll cost a quantum unit, and if you want to repeat that experience, inflating to current-year dollars, if it costs vastly different, more or less, you either have a breakthrough, which everyone will then want to figure out why it cost so little, or youre doing something wrong. And I think the miraculous thing about James Webb is, its much harder than Hubble. It has to operate close to absolute zero, 40 Kelvin, a million kilometers from Earth, not in Earth orbit, it cant be fixed, and it doesnt fit in the rocket it launches on -- it has to unfold when it gets there. Q: I worry about it not unfolding properly after launch. Thats always a risk for these space missions, isnt it? MM: Those technologies are the ones we inherited from industry. Theres no way you can launch a 19-meter antenna. But you need two 19-meter antennas if you want to transmit HDTV and internet from geostationary orbit, where you make real money. Such deployable antennas are the provenance for the star-shade technology. For JWST its this plus a whole raft of large deployable technologies aerospace companies use. JG: And of course, everybody needs HDTV. CNN reported that this year, the television rights for advertising just for college basketball exceeded NASAs budget. The rights for college football is much more. So what are our priorities? When you heard about bank bailouts and these kinds of things, we could have fleets of James Webbs for the AIG bail-out. Obviously that was a national priority to prevent collapse -- or at least that was the story -- but those were very big numbers, and these are very small numbers. MM: No, its just a government project. MM: What is James Webb for? Its pure science. Its part of the scientific endeavor. Its like Hubble. Hubble was paid for by the taxpayer. How many kids did we turn on to science because they saw a great Hubble picture? In Hubble we make two discoveries a day. People shouldnt be paying for those images because the taxpayer already paid for it upfront. JG: The whole point is, right now the commercial space industry for human spaceflight, or even commercial orbital transportation of cargo for human space flight at NASA, its almost fully subsidized by NASA. Companies are saying its commercial. But none of them would exist if it wasnt for NASA putting money up front. Not tens of dollars, but hundreds of millions of dollars. And the reason is, and this commercial drive is, is the hope that they will spur on industries that are subsidized. And so for instance, the companies that are building James Webb Space Telescope, NASA is paying them to build it, and NASA is paying the other companies to develop technologies for James Webb Space Telescope, and its to do pure science. Its to discover an Earth-like planet around nearby stars, to discover the very first stars that ever formed in the universe -- these incredible things. What does that do for us? Well, for the company thats building it, when they go to build the next communications satellite, or the next spy satellite, or the next commercial satellite for something else, they have all that expertise now that allows them to build it that otherwise they would not have been able to invest in. Because they werent trying hard things. If the United States doesnt try to do hard things and really interesting things, all were going to end up with is college basketball, professional sports, entertainment, and service [industries]. MM: And the other thing is, it inspires people to say, do want to work on the telescope thats going to find the first life? It doesnt matter if you work for NASA or a commercial company, that gets the engineers interested. The company brings in very smart people, and whats more, they can talk about what they do. Because when theyre working on a spy satellite, they cant even tell their kids what they do. But to be able to tell their kids and their spouses that they are working on the forefront thats going to change the world... the companies always tell you theyre incredibly proud to be associated with these missions. And they even occasionally make money. Theyre getting a huge return on their investment. Congress several years ago worked out that for every dollar invested in space science, 7 dollars got returned to the US economy over a period of 20 years, from the sheer technology flow. In Europe they made a similar calculation, that for every dollar they invested in big science in Europe, roughly 3 to 4 dollars got returned to the European economy over the same period because of the improvements. You know, if we hadnt funded this crazy German who talked about relativity and bending the light, or this crazy guy who wanted to build a device based on that strange quantum theory thing and all he talked about was dead cats in a box -- I mean, what was he talking about? But because they funded those things, we now have GPS. JG: All of news about the James Webb Space Telescope over the past year has been about how its expensive, its going to take a long time, and if only we didnt have to spend that money, wed be able to do all these great scientific things. And what has been lost for some reason that I dont understand -- maybe because Im a newcomer to the project -- is that, yes its expensive, but its also, enormously by many factors, the most capable astronomical facility that well ever have. And in the fields of dark energy, dark matter, all of astrophysics, but specifically in exoplanets, it does all the things that everybody is saying, oh, if only we didnt have James Webb we could do this. But James Webb does it, and does it better than they think the new missions might. So its very frustrating. It's a tough sell by short sighted measurements, but not if you can see it with a wider lense. It's like if you ask them what they will find and what we will get out of it, and the answer is "Nobody knows", and that answer is more exciting than any other possible answer. When you are able to do something that has never been done before, there is literally no limit to what you might find. Also, as they said above, the cost sounds like a lot, but it's really not that bad. 8 billion spread over 15 years? I wonder how much that adds up to in annual tax burden for the average US citizen? 8.7 billion over 15 years = 580 million/year, divided by 312,448,000 people in the US = $1.86 per person per year for 15 years. I know that calc is oversimplified, but it gives some perspective. It would be interesting to see what pet projects these congress folks that are trying to kill the JWST are pushing. It would not be too surprising to learn that the cost of their favorite boondoggles adds up to many times that of this space telescope. I'm sick of the common mind set that if you can't eat it or screw it or cash it in, what good is it? Yikes! It's like if you ask them what they will find and what we will get out of it, and the answer is "Nobody knows", and that answer is more exciting than any other possible answer. I wish more people accepted "I don't know" as a valued answer, as an exciting answer, as a challenge to find out. Far too often, people prefer the ignorance of certainty over the certainty of ignorance. The former closes doors, while the latter opens doors leading to knowledge of the universe. So if the program were to be cancelled, they would just stop production and let it sit there? Would they sell it off to the highest bidder, China or the ESA? It seems criminal that something designed so beautifully and set to discover a deeper understanding of the universe, would be left to rot simply because of the state of politics. I'm all for spending money on science, I think we should double NASA's budget. But that said, I have just one question about this article. If the JWST operates in the spectrum between orange and deep infrared, how is it supposed to detect that an earth-like planet is blue?